Lama Yeshe Rinpoche received transmission in Nepal from Tulku Urgyen Rinpoche on the 49 day Bardo practice, that has to be accomplished in total solitude and darkness. He has since completed two more of these highly specialised retreats, once on Holy Isle and, more recently, at the Purelands retreat centre in Samye Ling. 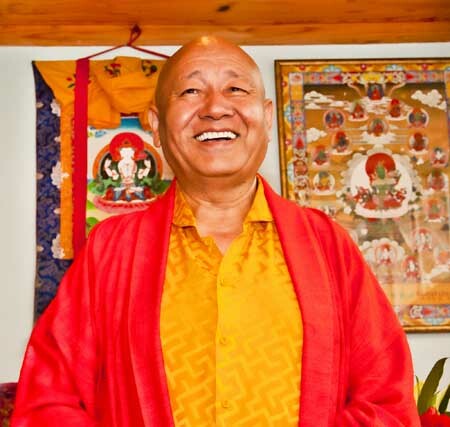 This rare accomplishment has made him one of the foremost meditation Masters alive today, about whom His Holiness the 17th Gyalwang Karmapa recently said, "If you want to know about meditation, look no further than Lama Yeshe Losal." In 2009 he welcomed both Christian and Buddhist practitioners to an inter-denominational Meeting of Contemplatives and a follow-up meeting is planned for June 2012. Meanwhile, Lama Rinpoche is much in demand as a speaker at major events around the world: in 2009 he was invited to Miami to address a World Leadership Conference hosted by the International Women's Forum and in 2010 he returned to the USA as the key speaker at an annual meeting of leading lawyers.